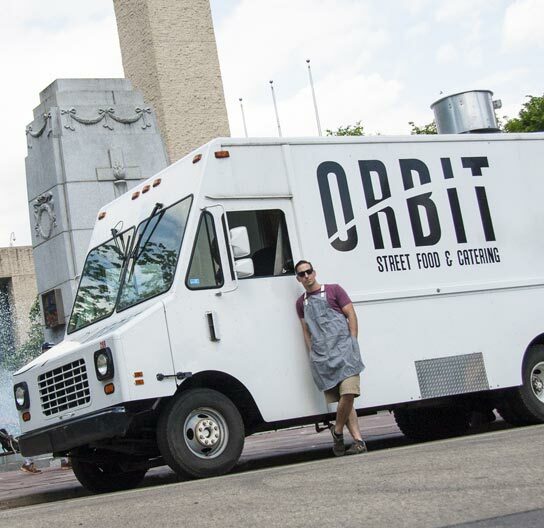 The origins of Orbit food truck are rooted in the summer of 2009. Former teacher and aspiring self taught chef, Marc Swerda, saw what was an emerging scene south of the Canadian border as an opportunity to get his feet wet in the culinary world. A growing passion for food and refinement of skill could no longer be contained, and Orbit food truck was born in the fall of 2013! Food has always played a role in bringing people together and street food culture has always been a part of this. Opening a food truck provided us the opportunity to connect our passion for food with community. The chance to roam city streets, play a role in various events, and work in the heart of a vibrant and diverse city whilst bringing delicious food to the masses could not be passed up! The taco became our vessel to showcase Orbit’s flavour profile. Drawing inspiration from travel and cultural experiences, Orbit’s menu always has an international flare. We strive to deliver big bold flavour, while at the same time aim to maintain the integrity of fresh ingredients. We are proud to be a part of the Edmonton food scene and are ecstatic to serve the people of this dynamic and evolving city. Without your support, we don’t exist. Thank you! If you’re interested in catching one of our flavour bombs, we are downtown for lunch service, 124 Street Grand Market Thursday evenings, and can be spotted at various events throughout the summer. Hope to see you at the truck!